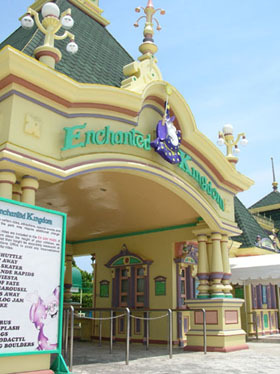 I'm at the Philippines right now and yesterday I went to this amusement park called Enchanted Kingdom. 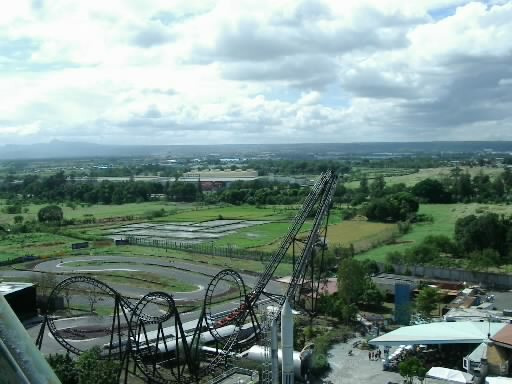 It was a basic park with rides for children, 2 roller coasters and 4 water rides and a hell of alot of flat rides. Anyway the rides were: Space Shuttle Roller Skater Wheel Of Fate Jungle Log Jam Rio Grande Anchors Away Flying Fiesta Swan Lake Bump N Spalsh Grand Carousel And some other kiddy crap. Space Shuttle was basically a nomal Boomerang with 3 inversions. It reminded me of the Demon so much because its track was painted black and the train was painted red. It also had baulky OTSR, it was also as rough as the Demon. Space Shuttle's themeing was heaps GOOD! I didn't have to line up, it was a complete walk on! Roller Skater was a steel version of the Beastie. Quite rough and Quite boring but the theming is good. Wheel Of Fate was basically a Ferris Wheel as tall as the Space Probe, it was alright. I got to check out the parkwhie I was stuck at the top for half of my life. Jungle Log Jam was probably the best ride they have! It's WAY better than the Wild Wild West. The first drop was pretty tall but the second was unbelievable! The second drop was about 26.2 meters tall, crazy ****! The ride lasted for about 5 minutes and the theming was probably the best in the park. Rio Grande was a duplicate of the Snowy River Rampage but rougher rapids! 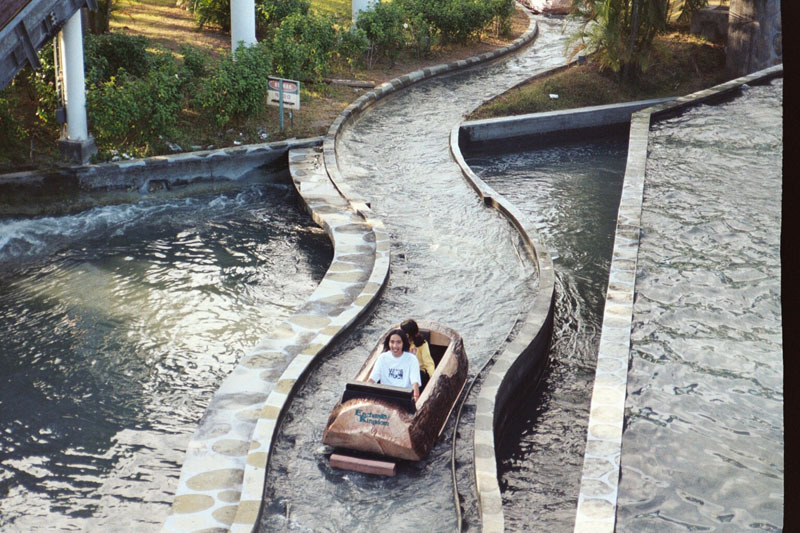 You'd be lucky not to get wet on that ride. When I went on it I thought I wouldn't get wet one bit but I was wrong. I got off the ride soaking wet, like I dived into a river without taking my clothes off! Anchors Away was a normal swing ship. Wasn't that good. Flying Fiesta was also quite boring, it was just a nomal flying chairs ride. The good thing about the park was that you can go in and out as many times as you want during the day. Just as long as you have your ticket with you and your ride bracelts. 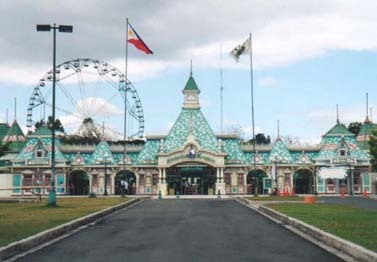 The park prices are: EK All Day Ride Pass - Php500 which is about $12.50 AUD EK Kiddy Day Pass - Php350 which is about $8.75 AUD Unlimited Grand Carousel Pass - Php250 which is about $6.75 AUD I give the park the park an over all rating of 9/10 because of the friendly staff and the theming was good. The park was also kept clean. I'll post pictures as soon as I get back to Australia. Here are the pictures as promised. I used my mobile phone to take these pictures. The camera was set on low quality VGA but I set the camera on 1.3 mega pixels to take one of the pictures. I didn't have enough room in my phone's memory stick to take 2.0 mega pixel photos because I have heaps of music stored in my memory stick. More pictures will be added once I find my phone's other memory stick which has all the high quality 2 mega pixel pictures. 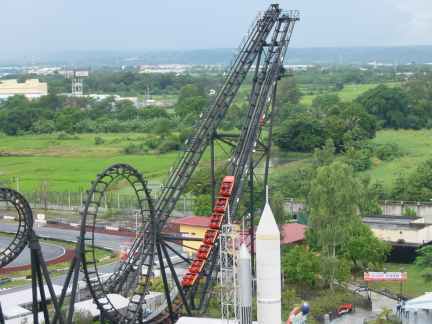 I was over in the Philippines in January but that park was closed. BTW Have you been to Splash Island water park that was also closed.